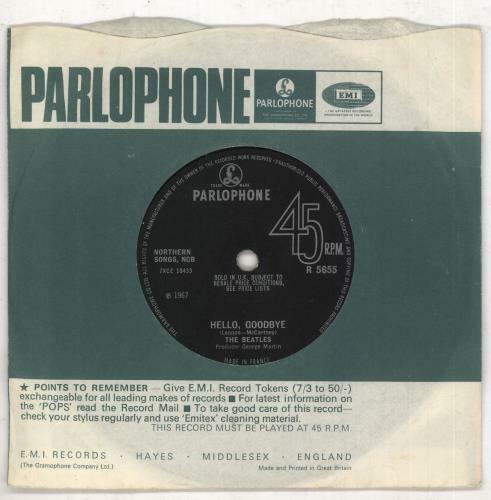 THE BEATLES Hello, Goodbye (Scarce 1967 UK Pathé Marconi pressed solid centre 7" vinyl single, also including I Am The Walrus. During the peak of Beatlemania, EMI were forced to outsource pressing of some singles & LPs, just to meet demand. These were mainly to Oriole, CBS, Decca & Pye, sometimes Philips. This is a French Pathé Marconi sub-contracted pressing without stamper letter at 3 o'clock in the run out area and 'Made In France' text at the bottom of the label where the 'Made In Britain' text usually is. Issued in a Parlophone company die-cut paper sleeve, the vinyl is in VG- / VG condition, with several light surface scuffs but plays through without fault. One of the hardest sub contracted pressing to find! R5655).